Benito tells Cathy that Paul has fired him. 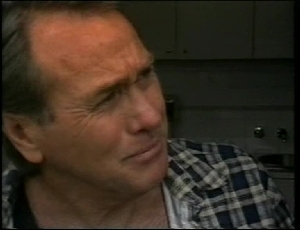 Doug tells Jill that he hates her and she's to stay away from both him and his family. Jill stands on the edge of the balcony and threatens to kill herself if she can't have Doug. Doug tells her to come down. She refuses until he says he loves her - but Doug refuses to - he doesn't love her and he never has. He offers to call a doctor and suggests a counsellor will help her through it. Jill is adamant that if she can't have Doug, she doesn't want to live. Doug says there's nothing else he can say and leaves. She yells after him, but he shuts the door to the flat. Beth has arrived to see Brad. She's worried that after his behaviour at the Waterhole, they're no longer dating. He says there's nothing to worry about and after some prompting from Beth, thanks her for getting the assault charges dropped. He tells her she needs to lighten up! Doug is on the ground floor outside and Jill can be heard shouting. 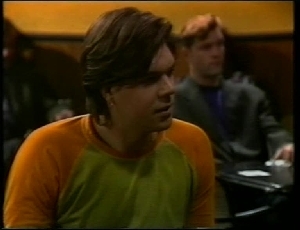 Lou drives up - Gaby told him that he'd find Doug there. He tries to talk Doug out of visiting the 'she-wolf in her den'. 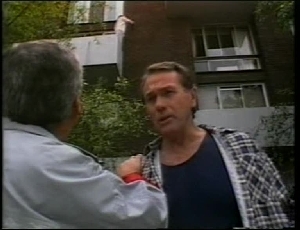 Doug tells him to look up and Lou is shocked to see Jill standing on the edge of the balcony. Doug tells him that she's bluffing and walks off. Lou yells up to Jill and tries to talk her out of jumping. Jill wants Doug to come back but Lou is persistent and eventually, she gets down. Toby wants Phoebe to celebrate her 18th. Stephen agrees and they decide on a fancy dress party - but it has to be a spooky one where everyone dresses in gothic stuff - they decide that it's suitably weird for Phoebe. Dorothy says a party is fine but she'll be busy at the election. DOROTHY: I won't be able to spend much time here. Dorothy is extremely confident about winning the election. Doug and Lou are having a beer at a table. Lou took Jill to the hospital and she's going to see a shrink. Doug hopes he never has to see her again - he wants his family back and his life back to normal. Lou tells him that it's one thing at a time. Benito walks in and goes to the bar. MADGE: Good evening, Boss. ...what's your problem, or shouldn't I ask? BENITO: Don't call me that. MADGE: Why not? You are! BENITO: Not anymore I'm not. Benito seems shellshocked at losing his job but he says that the car yard is doing so well, he can't manage Lassiter's at the same time. Madge is horrified. MADGE: You are giving up a high profile job at Lassiters to run a car yard?! Benito tells her that Alessi Autos is his own business whereas Lassiter's is owned by Paul, so he needs to get his priorities straight. 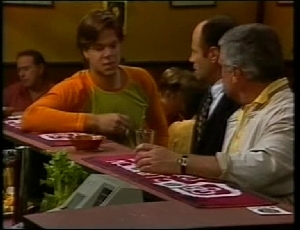 Lou comes over to the bar and joins in the conversation. Lou doesn't believe for one moment that the car yard is doing well - he's seen Benito's sales patter! 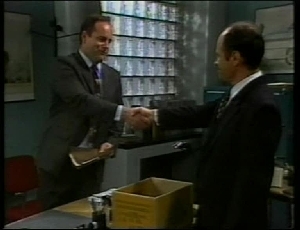 Benito tells Lou that he was considering staying on at Lassiter's and hiring Lou as sales manager but all things considered, he's glad he didn't. Benito stalks out, leaving Lou staring after him. It's Phoebe's birthday and Brad and Beth congratulate her. Phoebe thinks she's found a wrinkle - Beth tells her that she'll need plastic surgery! Stephen invites them both to the party and tells them about the fancy dress requirement. They ask what Phoebe is wearing but they're told it's confidential - not even Stephen knows. BRAD: One thing I do know, it'll be pretty freaky! Julie is typing when Benito comes in. He "wonders" who tipped Paul off about his conflict of interests but Julie denies all knowledge. Benito is confident that it's Julie, but she tells him that he should look at his own shortcomings rather than trying to place the blame on other people. Benito opens the door to his office. Philip is sitting at the desk and looks puzzled to see Benito walk in. Julie hurriedly appears behind Benito. BENITO: What are you doing in my office? JULIE: Excuse me, but it isn't really your office anymore, is it? BENITO: Until the replacement is found it is. PHILIP: Well, that's the thing, Benito. I AM your replacement. Paul hired me last night. BENITO: How convenient. Deny it now, Julie. Jim has arrived to visit Jill. Jim says that everyone understands how hard it's been for her since Ross was killed. She says she feels awful about what she did to Pam and Doug but Jim is being supportive of her. 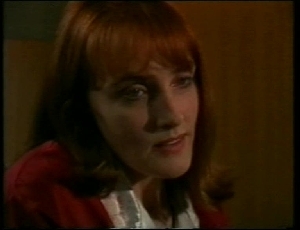 Jill says she realises now that she was very sick - obsessed and irrational. She's seen a counsellor and she's turning a corner. Jim wonders where she's going to go. She says she's going to stay with relatives in the country. Jim makes his excuses and a nurse comes in. She asks if Jim is the cousin that she's going to stay with. 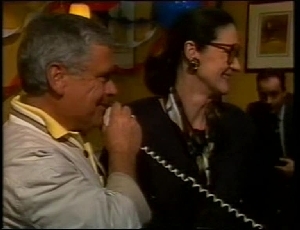 Jill tells her that Jim is her boyfriend and once she's better, they're going to go away together - just the two of them! Julie is filing and Phil doesn't look very happy - Julie told him that Benito resigned. JULIE: Resigned, retrenched, what's the difference? PHILIP: Did you tell Paul about Benito buying the car yard so I'd get the job? BENITO: Of course she did! JULIE: I don't have to stay here and listen to these accusations! Julie flounces off to "win the election". Phil apologises to Benito for what Julie's done - he insists he didn't have a clue what she was up to. Benito tells him that there's no hard feelings between them. Phil offers to ring Paul and explain but Benito tells him that it wouldn't change anything and the job is Phil's - fair and square. The two shake hands. Benito hands him the keys and wishes him lots of luck. BENITO: And speaking from experience, with Julie working for you, you'll need it. Julie is handing out flyers for the election campaign. Phil walks over to her, clearly not impressed. PHILIP: Well, you even surprised me with this one. It'll be the craftiest, most underhanded stunt you've ever pulled. JULIE: Philip, not near the voters. PHILIP: How do you sleep at night?! Julie thinks that her loyalty to Paul is important - and he needed to know that Benito wasn't pulling his weight. Phil is appalled that she got Benito the sack but Julie says that Paul made that decision, not her. PHILIP: And me being hired was Paul's decision? You have a way of putting ideas into people's heads, Julie. They both look over to see Benito leaving the offices. Julie doesn't understand the situation - Benito deserved to get fired and a replacement had to be found - why shouldn't it be Phil? Phil tells her that she must've done some hard and fast talking to secure it. Phil points out that Benito was hired over him in the first place because he was the better man for the job. Julie tells Phil to think about their financial situation and mentions that they'd be able to buy a house of their own with Phil at Lassiter's - and tells Phil that they'll be working side by side all day, every day! (Phil doesn't look overly enamoured by this!) She reckons that if she wins the election, they'll both be powerful figures in the community and seeing Julie's enthusiasm for their change in fortune, Phil relents and smiles. Benito walks into the bar where Lou is drinking with Cameron. Cameron tells Benito that the cheque he gave him for his work on the spaghetti sauce has bounced. Benito explains it away by him being busy - he must've forgotten to put the funds in the checking account. He apologises and says that sort of thing never happens to him. Cameron says it happens all of the time to "us paupers"! Madge asks Benito what drink he wants, but he changes his mind and leaves for the car yard. Lou reckons that Benito has money problems. 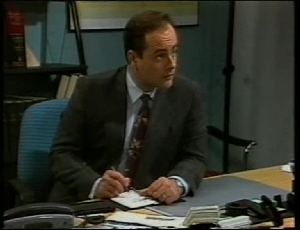 Cameron points out that one bounced cheque doesn't mean he's ruined, but Lou thinks that he struggled to buy the car yard and sales are well down. Cameron says it's none of their business! Cameron goes to sit with Doug in the corner. Cameron warns Doug that Pam has already asked his advice on divorce. Doug looks shocked. Dorothy and Julie are both handing out flyers outside the elections. Dorothy gives Jim a flyer but Julie scoffs at this, saying that Jim will definitely be voting for her! Jim takes one of each to keep Dorothy and Julie guessing as to which way he votes. They're both riling each other up and when Dorothy suggests that Brad vote for her and not a featherbrain, Julie is furious. DOROTHY: How do you know I was talking about you? You're not the only featherbrain running, you know! Julie is not at all impressed! She tries to crawl to Madge but Madge sees right through her. Doug tries to say hello to Brad, but Brad gives him the cold shoulder. Cameron says that Brad will get over it. "Fred Entwistle" is the voter infront of Cameron and Cameron looks suspiciously at him as he registers. Benito is trying to sell cars and failing miserably. Lou comes running out of the office and launches into his sales patter. Benito doesn't understand what's going on, but Lou tells him that he's saving his skin. He tells Benito that he's hopeless - the worst car salesman on the face of the earth! Benito admits it's a lot harder than he expected it to be and suggest he give up. 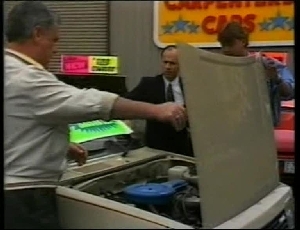 Lou thinks the pair should go into business - he wants to buy half of the car yard back because Benito is a financial whizz and he's a great salesman. Benito isn't sure but Lou thinks it'll be a winning combination and he knows Benito is struggling to meet the repayments. They shake on it. Everything is gothicised and Brad, Stephen, Toby, Hannah and Beth are all dressed up in black. Phoebe walks in wearing a stunning pink dress - she tells them that she likes to be different! Jim tells Doug that he's been to see Jill. Doug blames himself - he convinced himself that it was a one night stand and he didn't realise that she was psychotic enough to break up his family. Jim thinks it's only temporary but Doug tells him about Pam looking into getting a divorce. Jim looks thoughtful. Lou is ringing through for the election results. Julie is very impatient and Phil tries to calm her down. Cameron and Dorothy are chatting - "Fred Entwistle" is bothering Cameron because he's sure he knows the name but he doesn't know how. Dorothy advises him to stop thinking about it and the answer will pop into his head when he least expects it. Lou starts to announce the results. Julie Martin - 2 votes. JULIE: Two thousand votes? That's more than I ever dreamed of! Thank you, one and all! 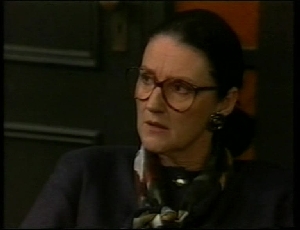 LOU: Er, Julie. Two. You got TWO votes. JULIE: Stop laughing! There must be some mistake. I demand a recount! Phil gets up to console her and Lou announces that Dorothy received 5,315. Everyone applauds but Percy Slade got 7,132 - he's the winner. Julie is slightly appeased by the fact that Dorothy didn't win but she wants to leave straight away. Phil tells her to sit down and finish her drink - they'll leave in a minute. Dorothy can't believe that Slade won by such a landslide. Cameron is stunned too. Phoebe thanks Stephen for the party. Beth and Brad compliment Phoebe on her dress. They have a toast but Beth points out that Brad can't drink alcohol. Stephen teases him over it and Beth tells the story about how Brad ended up flaked out on the floor at the Waterhole. Everyone laughs and Brad storms out, clearly angry. Beth looks stunned. Julie is still going on about only receiving two votes. Suddenly she realises that she voted for herself so either Phil or Jim didn't vote for her! She demands to know who didn't, but Phil and Jim merely look at each and don't say a word! Cameron tells Dorothy that he's worked out the mystery of Fred - he's dead and Cameron handled the will, which is how he remembered the name. Cameron thinks that dead people are voting in the election and that explains Slade's surprise win. Beth apologises to Stephen and Phoebe for Brad's behaviour before leaving. Toby is sent to walk Hannah across the street. Phoebe and Stephen sit on the sofa and he tells her that he can't believe that they're together. Stephen gets her present out - it's a ring. STEPHEN: I know it's kind of sudden but I love you, Phoebe. I want you to marry me.